The Monastery church dedicated to the Ascension of the Lord on the River of Milesevka, near city of Priijepolje, was founded by Serbian King Vladislav, c 1234/5. It was here that King Vladislav transferred from Bulgaria the relics of his uncle St. Sava, which he buried in 1236. The body of Vladislav himself was laid here as well. Mileseva (serb. 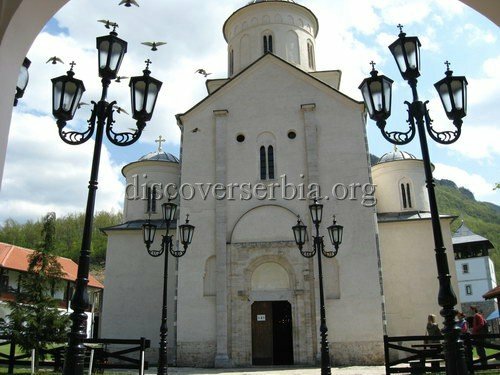 Mileševa) is one of the most important Serbian sanctuaries and spiritual centers. Some historians believe that the coronation of King Tvrtko I of Bosnia took place in Mileševa. In 1594, the Turks removed the relics of the greatest Serbian saint, St. Sava from the monastery and publicly burned them on Vracar hill in Belgrade, making him thus a posthumous martyr. The Monastery was also famous as a printing centre at the time of the Turkish occupation. In the first half of the sixteenth century, the first service books were illuminated here. The first group of frescoes were produced in the 1230s. The other groups include works from the Turkish period, to be found in the exonarthex. These thirteenth century frescoes may be considered to be the supreme achievement of all the painting in Europe of that time.